Because the vacation rental industry is so new and its potential so huge, I tend to spend my research hours doing activities that might otherwise be considered an inefficient or crazy use of one's time. 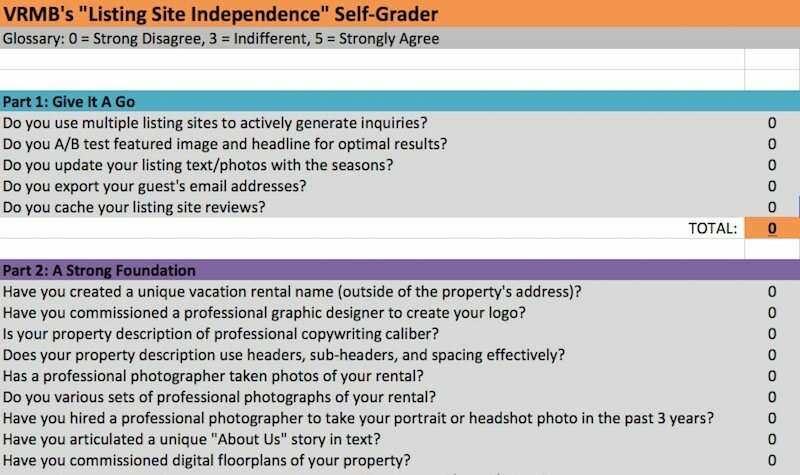 One perfect example would be the ﻿Listing Site Independence Self Grader﻿, which is a scoring tool I designed to help owners and managers identify what stage of independence they are in through the self-diagnosis. It's a very simple Excel spreadsheet, but it's only Version 1.0 and it really works! And when people download it, I ask that they fill it out and email it back to me in exchange for some specific tips to help them on the path to independence. The process of reading over every. single. self grader. and responding personally to each and every person takes a lot of time (probably 20 minutes per person and I get around five per day). Just yesterday, I checked in on how many self graders I had received and sent back since launch: 498. That's almost 10,000 minutes of consulting time! But I can justify it because the learning value is MASSIVE. It offers the opportunity to validate trends I am sensing, to spot new trends I didn't expect, and to get to know owners and managers' needs intimately. At this stage in the industry, I feel the "return" on that investment is well worth the cost. The quickest way I can tell a host is not thinking about independence is if they use a Hotmail or Yahoo or Gmail (loscuatrotulipanes@gmail.com) email address for their vacation rental business. Because it's so easy and inexpensive, the only reason for not getting a custom email address (matt@loscuatrotulipanes.com) is because no one has every mentioned it or you're just lazy. Get it completed in about 10 minutes with Google Apps. I see plenty of successful vacation rental folks who have succeeded without floorplans up until now. But because the industry is getting more and more competitive, I've observed a good set of floorplans emerge as the new gold standard to set one property apart from the next. It's one of those items that immediately eliminates buying friction. This too is a painless process that costs around $225 with Floorplan Marketing. A high percentage of self graders readily admit that they don't love writing and are not all that great at it. Which is totally cool. But realizing how important it is to reel the potential visitor into your world, it's not something that the most successful folks are willing to let slide. They're taking advantage of agencies like GuestHook who create compelling descriptions, blog posts, and newsletters for you. And tweaking, honing, and adjusting their text on a regular basis. When I speak with my business coach, he is always astonished to hear how few vacation rental owners and managers have a quality logo for their company. It's basically unheard of in most other industries -- a small business without a logo?!? But because vacation rentals are so mom 'n poppy, I find myself coming across a lot of self graders without a solid logo. For $150 with NetMenCorp, this hole in your marketing can be filled with cement. As an overarching rule, I notice almost all owners and managers are not helping their potential guests enough, instead focusing exclusively on trying to sell sell sell. To use a food metaphor, they are hunters, not farmers, which leaves themselves prone to feast or famine. The most sustainable owners and managers I interact with have some element of "help, don't sell" in everything they do. They blog about their area, distribute great tips on social media, and generously share their experience with anyone who wants it. The power of reciprocity is incredible. Having your former guests email addresses is the obligatory first step. Uploading them to a newsletter platform like Mailchimp is step two. And step three is sending them helpful (not salesy) newsletters once a month. With these three things (and some discipline) just about ANY owner or manager can cultivate life-long guests regardless of the size or price of their rental. A newsletter is pound-for-pound the most profitable long-term thing you can do for your vacation rental. But the vast majority of self graders don't do it well. First, most of these things are straightforward and inexpensive. Just take them one step at a time and enjoy the process. Famed food critic Ruth Reichl describes the meditative powers of cooking in a very similar way. Don't freak out. Just pour yourself a glass of wine and begin playing around. Second, it's an exciting time because most hosts have gotten themselves to this point WITHOUT EVEN THE BARE FUNDAMENTALS! Sure, you can get frustrated and overwhelmed, but until now you have done a lot with little! It's the poor kid who grows up barefoot kicking around a ball of rags in the streets. When he gets proper equipment, there's no stopping him! 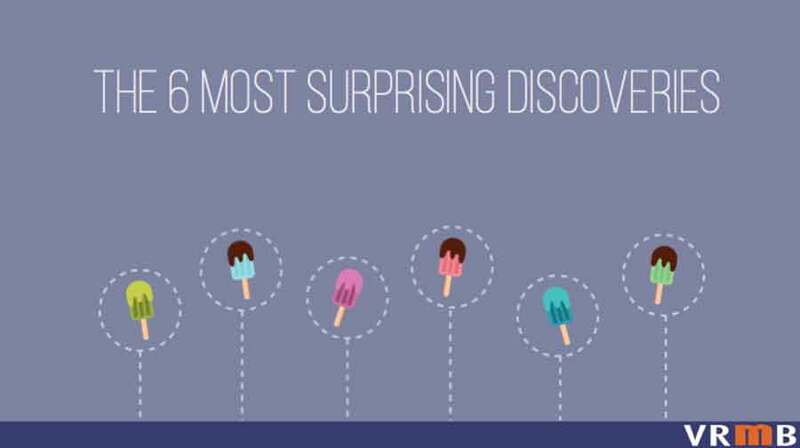 My hope is that you can take these missing discoveries and run with them. Make independence a realistic thing by hanging around the right people. Through sheer osmosis, you'll find yourself capable of great things.